Ribbon cutting ceremony held with community leaders. Hammond Square, Stirling Properties, the Greater Hammond Chamber of Commerce, and Hammond area community leaders celebrated the Grand Opening of Hammond Square Self Storage. 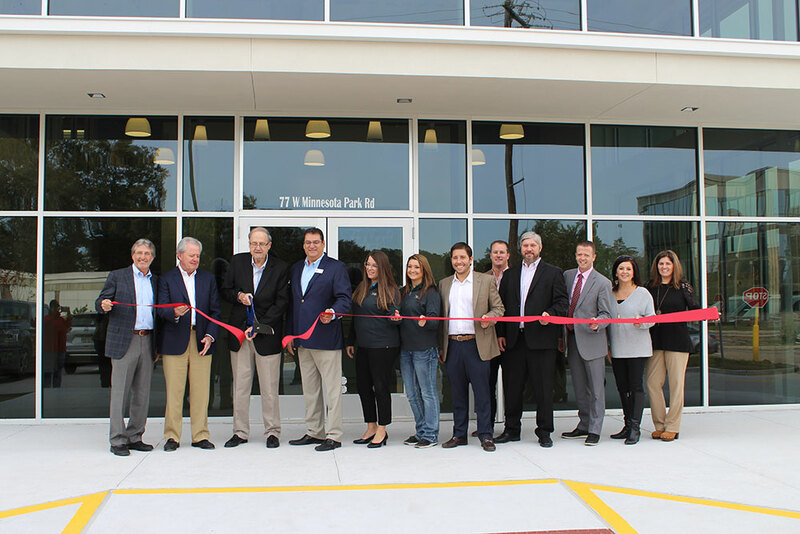 A formal ribbon-cutting ceremony was held with Hammond Mayor Pete Panepinto; Grady Brame, Executive Vice President with Stirling Properties; Jimmy Maurin, founder of Stirling Properties; and Julie Perise, Member Relations Director with Greater Hammond Chamber of Commerce. We would like to give a special thanks to Michael Brumfield, CEO of State Bank & Trust, who served as the lender for the project. Hammond Square Self Storage is a 93,902-square-foot self-storage facility located just off the corner of US Highway 51 (SW Railroad Avenue) and West Minnesota Park Road. The facility is comprised of 626 climate-controlled units and 15 RV / boat storage units, all with gated access. The 3-story building provides extra security and state-of-the-art amenities. Units are currently available for lease with sizes ranging from 5 x 5 feet to 10 x 30 feet. Stirling Properties developed the facility and will handle daily management. Stirling Properties has been at the forefront of commercial real estate investment and development in Hammond and surrounding areas of Southeast Louisiana for more than 43 years. 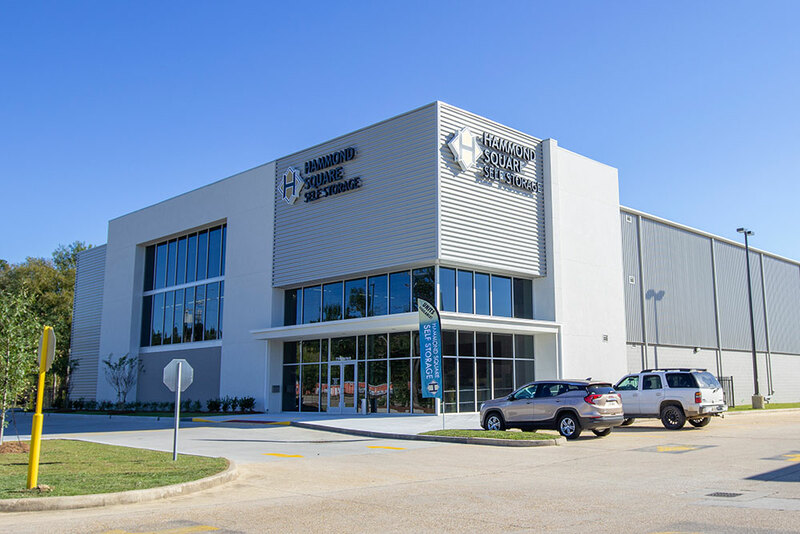 Tangipahoa Parish is experiencing significant growth, creating a high demand for self-storage services. Hammond Square Self Storage’s strategic location near Hammond Square retail center and I-12 will provide easy access and convenience for customers. “We are thrilled to welcome everyone to Hammond Square Self Storage, Hammond’s newest storage facility. As you look around this impressive, state-of-the-art building, you can clearly see how far storage facilities have evolved. Hammond Square Self Storage will be a great amenity to serve the growing population of Tangipahoa Parish,” said Maurin. Stirling Properties also redeveloped the neighboring Hammond Square shopping center, located on the northwest corner of Interstate 12 and Hwy. 51 (SW Railroad Ave.) in Hammond, LA. It is the 2nd largest open-air retail center in Louisiana encompassing 902,000 square feet of more than 40 national and local retailers, shops and restaurants, including Dillard’s, Target, The Home Depot, JCPenney, Academy Sports+Outdoors, AMC Theatres, and Old Navy (coming soon). For more information on Hammond Square Self Storage or leasing inquiries, visit www.hammondsquareselfstorage.com. Sign up for Stirling Properties News! Stirling Properties LLC is a licensed real estate brokerage firm in Louisiana, Mississippi, Alabama, Florida, and Texas.